Influential are proud to invest in promising local talent and last year took another step by signing up for the National Apprenticeship Service Scheme. 12 months on, the 2015-2016 apprentices look back on their year. How did they find it and what are they up to next? In 2015 Influential welcomed new local apprentices to our Maidstone office for a 12 month programme of learning and skill development. With their placements now complete we asked some of them and their training academy to reflect on their time here. The candidates were found through locally based 3aaa Maidstone Academy, who provide professional and exciting Apprenticeship frameworks and a first-class learning experience to support work placement. How Did the Apprentices Do? The apprentices began their employment with Influential at the end of summer 2015, with training classes from 3aaa and an assigned Influential mentor each. “They displayed an eagerness to learn”, remarked their Academy IT Tutor, Anton Balzan. “Each of them came with their own level of understanding in IT that they wanted to take to the next level.” Anton observed them “broadening and harnessing” the skills they knew they would need “at their place of work and for their future careers”. Influential have a proud history of investing in young, local talent and a number our highly skilled professional developers began their careers at Influential as interns or apprentices. “I look forward to continuing for another year and being able develop my skills not only in PHP but also my communication skills especially with clients.” ~ Sam Collins. Research shows that the UK economy gains £34 billion per year from apprenticeships and that for every £1 spent on apprenticeships, the national economy gains £21. This economic gain is a clear motivation to continue investing in them, but the social benefits are equally important. Apprenticeships promote social responsibility; by supporting local youth, companies are helping to develop the future workforce. This demonstrates an investment in the local economy, and a commitment to the community overall. This successful apprenticeship year is part of Influential’s continued plan to invest in local talent and continue company growth. For 25 years Influential Software has delivered quality business software & data solutions from within the UK. If you would like to talk to us about a business intelligence solution, software solution or any IT project you need to deliver successfully, please contact us. Research by Centre for Economics and Business Research (Cebr) has found that Apprenticeships contribute £34 billion per year to the UK economy, and that “for every £1 that is spent on apprenticeships, the national economy gains £21”. Apprenticeships boost productivity by enabling firms to grow their skills base. They also promote social responsibility and shows a commitment to the local community by developing the workforce of the future. The benefits of apprenticeships are clear – they make a vital contribution to the economy, boost business productivity and give people the skills they need to get on in the world of work. Are you looking for an exciting opportunity? We are looking for young, enthusiastic talent that are keen to begin their career in the exciting and rewarding Software Development and Business Intelligence industry. You will be directly exposed to the business community and can form close personal relationships with industry professionals, witness the inner workings of the business, and make valuable contacts. 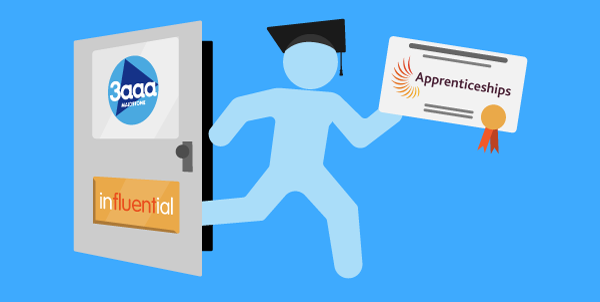 An apprenticeship means direct, hands-on training, a chance to hone the skills and tricks needed to become experts. If you are interested in becoming an Apprentice with Influential Software then please contact us today for more information, or simply send us an email.